In the days of Great Prince Ivan III Vasilievich of Moscow,3 the Orthodox Christians subject to the Germans had two churches in the Russian quarter of the city of Yuriev—one dedicated to St. Nicholas the Wonderworker, and other to the Great Martyr Saint George. Two priests served in these churches—one by the name of Ivan, surnamed Shestnik (i.e. stranger), was from Muscovy; the other was called Isidore. When the Germans—at first with promises, later with threats—began to lure the Orthodox inhabitants of the city into Latinism, the priest Ivan, who had dwelt in Yuriev all of two and a half years, left for Pskov. Soon thereafter he received the monastic tonsure with the name Jonah and founded the Pskov‐Caves Monastery on the border of Pskov and Livonia. Having dwelt there in a holy manner, he was accounted worthy of a blessed repose in the Lord. 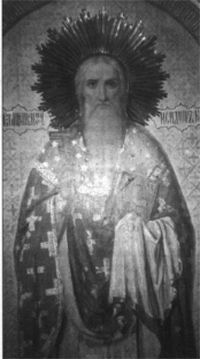 (Commemorated March 29) But Isidore remained in the city of Yuriev and had great disputes with the Germans on the Orthodox faith. Not infrequently he reproached the heterodox, exhorting them to abandon the Latin faith (Roman Catholicism) and embrace Holy Orthodoxy. In 1472, the Latins took up arms against the divinely‐protected city of Pskov and the Orthodox populace subject to it, in order to plant in its midst the Latin faith confirmed principally by the canons of the pseudo Council of Florence (1438‐1439; which was never accepted by any of the Orthodox Churches) at which the Latins had decided to reinstate so‐called Christian unity by force. Meanwhile, the priest Isidore served blamelessly at the Church of Saint Nicholas the Wonderworker as a star shining forth amongst the Christians of his flock. 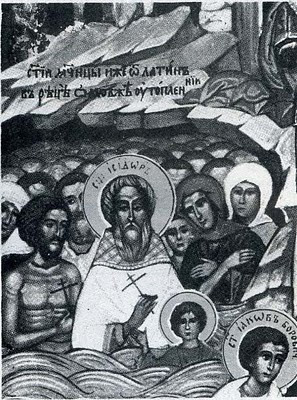 And it came to pass that the elder of the city of Yuriev, a German by the name of Yuri Tryasigolov, rose up against Isidore and against the Orthodox Christians and complained about them before the Latin bishop Andrew and the city rulers, who were also of the Latin persuasion, and the merchants of the Livonian land, saying that he had heard from this Russian and his whole flock blasphemy against the Latin faith and the use of unleavened bread, and praise for the Greek faith alone. Thus did he stir up wrath amongst the bishop and the nobles; thenceforth the Latins sought to torment the Orthodox Christians of the city of Yuriev. Afterwards the holy Isidore with his companions stood in the prison facing east and began to sing and to pray with tears and heartfelt sighs. He partook of the reserved Gifts of the Holy and Life‐creating Mysteries and communed all the men, women and children who were with him. All were filled with spiritual joy, and the devout priest instructed them again concerning the reward of eternal blessings for good deeds and of eternal torments for deeds of darkness. Then, like serpents, consumed with rage against the Orthodox, the stern bishop and the other judges ordered all of them driven into the river Omovzha in whatever clothing they had on. Saint Isidore, still vested as a priest, was cast into the very hole in the ice through which, through Orthodox prayers, the water had been sanctified earlier on the Feast of Theophany. Thus did they deal with them as with criminals, executing them in a cruel manner for their Orthodox faith in Christ. Seventy three suffered who considered Saint Isidore their instructor. They surrendered their pure souls into the hands of the living God and were crowned with crowns that fade not away. There was at the time of their martyrdom a most wondrous sight. Among the Orthodox was to be seen a young mother who had in her arms a three year‐old child, most beautiful and comely of countenance. The wicked Germans wrested the infant from his mother’s arms and cast her into the river. Beholding his mother drowned with the blessed martyrs, the child began to weep in the arms of the tormentors, and however much they tried to calm him, he struggled all the more, scratching their faces. Then the cruel tormentors cast him down beside the hole in the ice. The lad, creeping up to the hole itself, crossed himself thrice, and facing the people, exclaimed: “I also am a Christian. I believe in the Lord and wish to die, as did our teacher Isidore and my mother.” And thus saying, he cast himself beneath the ice. Thus did a child suffer for the truth, as of old the infant‐martyr Cyricus, who confessed the Lord on the knees of the tormentor as he beheld the suffering of his mother Julitta, and received a martyr’s crown with her (commemorated July 15). Spring arrived and the river Omovzha overflowed its banks. Then did the relics of all the confessors of Christ appear almost three miles upstream from the city of Yuriev, under a tree near a mountain. They were all incorrupt and lay facing the east, as though arranged by human hands. The priest Saint Isidore lay in their midst in all his priestly raiment. Thus did the Lord glorify His holy saints. Then the Orthodox merchants of the city of Yuriev took up the relics of those who had suffered and buried them in the city around the Church of Saint Nicholas the wonderworker where they shall rest until the Second Coming of Christ. The Orthodox Christians began to venerate the memory of the Hieromartyr Isidore and his 72 fellow martyrs not long afterwards, no later than the mid‐1500’s. The Church, however, did not rank them among the saints until 1897. Then, with the blessing of the holy Synod, it was decreed that their memory be celebrated; the first such feast of the holy Martyrs was solemnly observed on January 8, 1898. The first account of Saint Isidore and his fellow martyrs was written down by Hieromonk Varlaam of Krypetsky Monastery about the year 1560 with the blessing of Makary, Metropolitan of Moscow. The present translation was taken from the Lives of the Saints, second volume of the appendix to Saint Dimitry of Rostov’s compilation, Moscow, pp. 19‐24. 1 Present day Tarty in Estonia. 2 For the endorsement by Augustine of Hippo on coercion see Letter 185, 4‐6. Orthodox Life; Holy Trinity Monastery Jordanville, NY 13361 Vol. 28 No. 1 Jan.‐Feb., 1978 pp. 3‐7. 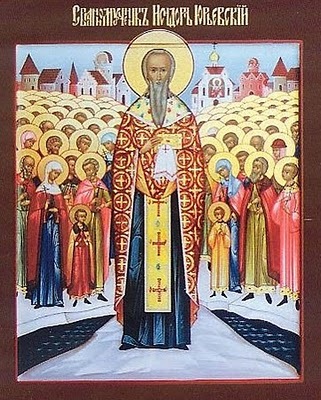 Come you faithful, and let us praise in hymns the Hieromartyr Isidore and with him the 72 martyrs who suffered in our city for the Holy Orthodox Church, to confirm us in her true and holy faith, to urge us to obey the teachings of our fathers and for us to live in accordance with the Lord's commandments and so, having completed this life, to obtain eternal life with the hymn: Rejoice, Isidore, firm guardian of the Orthodox faith! Rejoice, Isidore, our good shepherd! Rejoice, O teacher of the true faith! Rejoice, icon of the Christian life! Rejoice, calm and holy pastor! Rejoice, all-wise leader of our people! Rejoice, indicating the way of life to youth! Rejoice, great leader of men and women! Rejoice, support and joy of the elderly! Rejoice, Isidore, firm guardian of the Orthodox faith!